Sophie Perry says she misses her father, Luke Perry "a little extra today"! 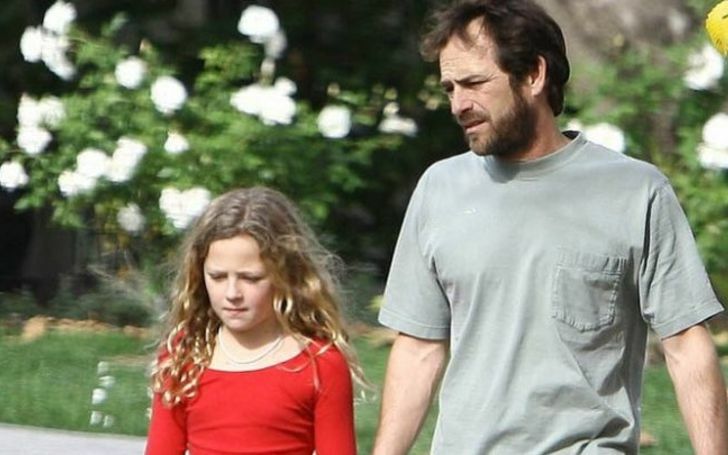 Late American actor Luke Perry's daughter Sophie Perry is still mourning his passing. She took to Instagram on Sunday to commemorate her beloved father and it is the second time since the globally renowned Beaverly Hills actor breathed his last on 4 March 2019. He took his last breath following the removal of life support after the second stroke. Preceded and succeeded by heart emojis, Sophie's caption read: "miss him a little extra today." In the post, the 18 years old girl's father is driving a car while she is sitting next to him, cuddling a seemingly asleep dog. And most important, they appear on cloud nine, in the photo, which she can no longer feel these days. As a matter of fact, she still seems to be working through the trauma as it has not even been a month since she last saw her father. Previously, she posted a photo on 6 March, two days after losing her father to a stroke. Accompanying the photo was her heartrending message to her and her father's fans alike. She had acknowledged the sympathizing words that came from around the world. Following the demise of her father, Sophie often mentioned him in her posts and she seems to be trying really hard to overcome the pain. She even thanked her mother Rachel Sharp for inspiring her to become strong. The sweet teen girl named her mother a "the toughest and sweetest and amazing woman." I’ve learned so much from you, and my heart is broken thinking about everything you won’t be here for. I’ll miss you every day that I walk this earth. I’ll do whatever I can to carry on your legacy and make you proud. I love you Dad. Along with his in-ring photo, the heartbroken son posted his childhood photo with his late father. The late actor appeared for the last time in the movie Once Upon a Time in Hollywood in the role of Wayne Maunder. Unfortunately, he could not witness its result as the movie was released posthumously. Likewise, he had been an active cast member of Riverdale from 2017 till his death at age 52. Furthermore, he was also engaged to be married with Wendy Madison Bauer. In fact, he already contributed a lot through both the tv series and the movies and yet a lot was remaining for him to do. May his soul rest in peace forever and may God be with his bereaved family!